The “acorn” street-name sign is as much a Toronto icon as are City Hall or the CN Tower. Though the design has graced the streets of many municipalities across Ontario and elsewhere for nearly 70 years, it’s thoughts of our city that it conjures up for many people. Its versatility allowed neighbourhoods and business improvement areas to display their identities to the world. Once described by the Globe and Mail as consisting of “a separate metal frame, a painted white face with embossed black lettering and a three-dimensional acorn like the cherry on a sundae,” the acorn sign marked an improvement over earlier versions that were often illegible (if they were posted at all). But, as is often the case when it comes to infrastructure decisions, concerns about fiscal responsibility led city fathers to put off improving street signage while calls for action grew. Though the design is being phased out for economic and safety reasons (the new signs are easier to read from a distance, meaning drivers are less likely to cause accidents while negotiating their routes), Torontonians retain their fondness for it. Bids in the current online auction for decommissioned signs run into the four-figure range. <b>Blue-and-white sign at Richmond Street West and Bathurst Street.</b><br /> <br><br /> During the early 20th century, Toronto was criticized by residents and tourists for its lousy street signage. Intersections, when they were marked at all, featured blue-and-white signs posted high enough on the sides of homes and buildings that passengers sitting in horse-drawn vehicles could see them, or wooden markers placed wherever they could be. Newspapers were filled with letters grumbling about dirty, illegible signs that were practically invisible at night. The situation grew worse with the rise of the automobile, as motorists got into accidents trying to figure out where they were. Over time, exposure to the elements wore down the acorn signs. Replacements saw some modifications, as raised metal lettering gave way to a painted version. 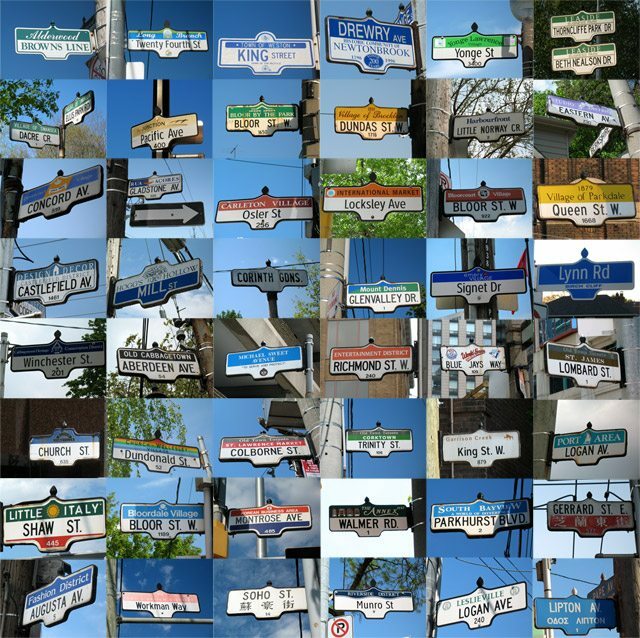 Our gallery illustrates the history of Toronto’s street-name signs, including developments in the pre-amalgamation suburbs. Additional material from the July 6, 1937, November 17, 1944, February 21, 1947, September 9, 1947, September 16, 1947, January 27, 1949, December 3, 1956, January 7, 1958, November 15, 1965, and February 11, 2011 editions of the Globe and Mail, and the October 23, 1926, July 5, 1948, July 24, 1959, December 23, 1968, March 19, 1970, September 14, 1996, July 11, 2004, February 8, 2007, and March 7, 2007 editions of the Toronto Star. Unless noted, all photos by Jamie Bradburn/Torontoist.